My research activities span diverse interests in the conservation, ecology and evolution of freshwater fishes, with particular emphasis on Eurasian salmonids. Currently, I use primarily genetic-based approaches to answer population genetic and phylogeographic questions on the current structure, diversity, and evolutionary history of salmonid fishes, such as European and Asian graylings (Thymallus sp. ), whitefishes (Coregonus sp. ), brown trout (Salmo trutta), soft-mouthed trout (Salmo obtusirostris), belvitca (Salmo ohridanus), lenok (Brachymystax lenok), and Danube salmon and Taimen (Hucho spp. 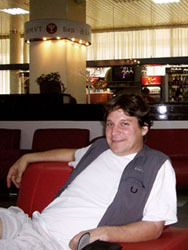 ), and Sahkalin taimen (Parahucho perryi). I have also worked with common carp (Cyprinus carpio), the endangered mudminnow Umbra krameri and the cyprinid genera Garra and Rutilus. While freshwater fish is my specialization I have cooperated in research on a variety of other organisms including salamanders, fruit flies, rabbits, stoneflies and otters. In addition to a focus on basic research, a mandate of my contract and continued employment at the University, I am also involved in a number of conservation issues, such as promoting the protection and sustainable use of native genetic resources in Austria. Therefore my group also takes in a number of small contracts involving the genetic characterization of both wild and hatchery stocks of native Austrian fish, such as brown trout, grayling and Huchen. Currently we have a data base containing multi-locus genetic profiles for over 4000 brown trout, 4000 European grayling, 2000 Asian grayling, 1000 whitefish and several hundred Huchen. In addition to my purely academic activities and conservation interests my experience and education in ecology and environmental issues, my volunteer activities for the International Union of Conservation (along with 1000s of other scientists), and my obligation as a teacher has ushered me into some public activity involving the conflicts concerning the uncontrolled expansion of hydropower in Austria as well as other regions of the world. This expansion has reached a level of fanaticism that not only wholly ignores facts and scientific understanding, but also subjugates all other environmental issues as well as the diverse interests of its citizens to the single-minded wishes of the energy industry and its associated financial backers.